If you enter a PowerShell script in the start fields of the export job, this is now executed directly in EEAttachments. Messages such as errors and information can be displayed directly in the EEAttachments log. Furthermore, arguments can no longer be passed as text, but also as objects, because session variables with the corresponding information are generated. 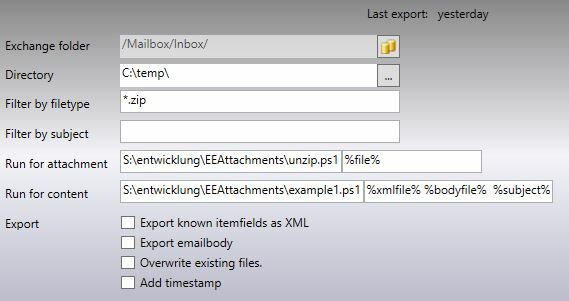 mailitem: The mailitem from EWS (Microsoft.Exchange.WebServices.Data.Item) You can access all properties in the PS-Script and modify the mail as well. And other properties specified in the arguments field from the EWS EMailSchema (Microsoft.Exchange.WebServices.Data.EmailMessageSchema). bodyfile: File name of the mail bodyfield which has been exported as HTML. xmlfile: Filename of the exported properties as XML. And other properties specified in the arguments field from the EWS EMailMessageSchema (Microsoft.Exchange.WebServices.Data.EmailMessageSchema). This script loads the module "Managed EWS" into the PowerShell-Session and accesses the subject and body properties. By "Write-Information" it can display the output on the EEAttachments log. If there are errors in the script, you can see it on the log as well. Here you can learn how to change the flagstatus to "Complete" after the mail has been processed. hide thisPlease keep the PowerShell scripts on a location where an unauthorized person can't modify it. Since the item object contains the credentials (with the password for the current connection), which could then be stolen in this case.